As the EU considers extending its approval for the weed-killer, African researchers highlight safety concerns. 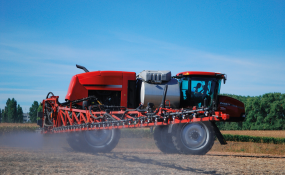 African researchers have intervened in a controversial debate involving scientists and decision-makers around concerns that the agricultural chemical glyphosate might be carcinogenic, and have called for the precautionary principle to be applied. Glyphosate is the main ingredient of Roundup, the most widely used herbicide in the world. According to a study conducted by the statistics company Statista, global consumption of glyphosate rose from 56.3 million kilograms in 1994 to 825.8 million kilograms in 2014. The compound is often used on African farms under the trade name Roundup. A study that assessed the value of glyphosate in the South African agricultural sector with a focus on the 2012/3013 season, concluded it was the country's most used herbicide and found that in 2012, over 23 million litres of glyphosate were sold at an estimated value of 641 million rand (approximately US$ 47 million). However, many in South Africa and in Europe are demanding an outright ban of the product. It is popular with farmers who appreciate its effectiveness, but loathed by a section of civil society concerned about evidence that it could be a carcinogen. The International Agency for Research on Cancer (IARC) has classified glychosate as probably carcinogenic. At the beginning of the year, around 40 European NGOs launched a European Citizens' Initiative to call for a ban on glyphosate "in line with EU pesticide law that prohibits the use of substances that may cause cancer in humans". On 25 October, the European Commission will hold a vote on a proposal to extend, by ten years, the commercial licence of this product. A public campaign is underway to stop approval is underway. Lacking the capacity to carry out their own rigorous assessment, African decision-makers will most likely be paying close attention to any decision taken by the European Union on this question. A significant number of African countries acquire agricultural inputs on European markets. Glyphosate is part of a group of 80 chemical agents considered potentially dangerous, according to the IARC Monographs on the Evaluation of Carcinogenic Risks to Humans. IARC researcher Kathryn Guyton told SciDev.Net that "this is based on limited evidence that glyphosate causes NHL (Non-Hodgkin Lymphoma) in humans and convincing evidence that it causes cancer in laboratory animals". The IARC also concluded that there was strong evidence of genotoxicity, both when it comes to 'pure' glyphosate and its formulations. However, the IARC assessment has been challenged by the European Food Safety Authority (EFSA) and the European Chemicals Agency (ECHA). The IARC told SciDev.Net that it does not comment on evaluations conducted by other health agencies. "The Monographs Programme provides scientific evaluations based on a comprehensive review of the scientific literature, but it remains the responsibility of individual governments and other international organisations to recommend regulations, legislation, or public health intervention," it said in an interview. The fact that these agencies have come to different conclusions appear to be largely attributed to variations in the methodologies they describe. Some have, for instance, focused exclusively on glyphosate, while others have gone further to also look at the range of adjuvants ‒ chemicals added to enhance effectiveness and to obtain specific formulations. There are other differences: some studies were conducted in vitro, on laboratory animals. Others looked at health outcomes in people who work in the agricultural sector. A lively public debate around these issues is taking place in Africa too - particularly in South Africa and in Benin, where an NGO has called for the compound to be banned. In Senegal, the scientific community has made its views known to SciDev.Net. "Glyphosate is used by rice farmers in the Senegal River Valley but no research has been done on this molecule in Senegal," says Amadou Diop, a lecturer specialised in analytic chemistry and bromatology, based at the Analytic Chemistry and Bromatology Laboratory in the Faculty of Medicine, Pharmacy and Odontology of Dakar's Cheikh Anta Diop University. But, he adds, from the point of view of its chemical composition, glyphosate is in line with the rules that need to be followed. "What is more concerning is its potential genotoxicity," he says. According to Diop, "When there are strong grounds to suspect a given molecule may be toxic and scientific evidence does not show it to be harmless, common sense suggests that we should stop using it until we have conclusive evidence. That's the line that us Africans should take". SciDev.Net asked Monsanto whether it might consider suspending production of Roundup, on public health grounds, until the scientific community reaches a consensus. "The reality is that glyphosate safety is supported by one of the most extensive worldwide human health, crop residue and environmental databases ever compiled on a pesticide product," said the US company in an email statement. "In evaluations spanning four decades, the overwhelming conclusion of experts worldwide has been that glyphosate can be used safely." Monstanto added: "like all pesticides, regulatory authorities around the world routinely review the latest safety data on glyphosate. To be clear: No regulatory agency in the world has concluded glyphosate is a carcinogen". Diop also sits on Senegal's National Commission for the Management of Chemical Products (CNGPC - Commission nationale de gestion des produits chimiques). He says the commission had not formally debated the issue of the possible carcinogenic nature of glyphosate - but he intends to put the question on the agenda. Serigne Omar Sarr, a researcher at the Analytical Chemistry and Bromatology Laboratory in the Faculty of Medicine at Cheikh Anta Diop University in Dakar, called for a measured approach. "We're constantly coming across these situations where, from one day to the next, we're told that a molecule is toxic, when it's been used for decades without any problems," he told SciDev.Net. This is a serious matter with implications for food security, added Sarr. "You won't find any medicine that isn't also toxic". It remains to be seen to what extent banning glyphosate - at least at the level of individual countries, if not EU-wide - would have an effect on food security given the pesticide's popularity with farmers. Diop counters by pointing out alternatives that "work just as well". "There is a whole range of molecules that can be employed instead of glyphosate," he says. "Generally, organophosphorus compounds are used as insecticides, and we shouldn't forget biopesticides". But, moving beyond these debates, Diop believes that the best way forward lies in an integrated approach to crop management. "Not all of the soil's micro-organisms are bad for crops," he points out, before noting that excessive reliance on pesticides leads to soil depletion.Often, when inappropriate amounts of pesticides are used, yields don't increase, they go down," says Diop. This article was produced by SciDev.Net's Sub-Saharan Africa French edition.